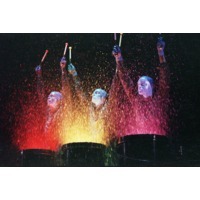 Blue Man Group is a creative organization founded by Chris Wink, Matt Goldman, Phil Stanton and Phil's brother Matt Stanton. The organization produces theatrical shows and concerts featuring music, comedy and multimedia; recorded music and scores for film and television; television appearances for shows such as The Tonight Show, Las Vegas, Scrubs, FETCH! with Ruff Ruffman, and Arrested Development; and a children's museum exhibit ("Making Waves"). All of the organization's appearances star a trio of performers called Blue Men, who appear to have blue skin and no voice, hair, or ears. The original founding Blue Men no longer perform and have since taken on administrative roles in the company. Because of the success of Blue Man Group, a parent company called Blue Man Productions was created, which produces all the Blue Man Group shows in the world. It currently has a staff of over 50 people.